Q: I have a male Snowshoe named Frances. He loves to pick on my roommate’s cat Sophie. Any suggestions? We live in a multi-cat household with my cats, fosters and 2 roommate cats. A: It is important to Increase vertical territory, so that all the kitties have places to go and settle. Make sure litter boxes and food and water bowls are placed in locations with a peripheral or landscape view from the kitties’ perspectives. This means that litter boxes and food and water bowls shouldn’t be flush to a wall or in a corner or location where there is only one entry or exit. It is imperative that you interrupt the staring and stalking by Snowshoe. Looking at Sophie is okay, but staring is not (fear based staring, with pupils dilated does not apply here). The difference between looking and staring is 2 seconds versus 3 seconds and I believe it is universal for most, if not all, animals. Being stared at is unsettling, and cats can use staring to displace another cat or to antagonize him/her or to create a fight. When this happens, the easiest thing to do is to redirect your kitty by repositioning him (the starer). Unemotionally pick him up, and reposition him so that he is turned or faces away from the victim kitty. He can stay in the same room initially. You must do this before Sophie feels the need to retreat, hiss, or flee. Do not engage with Snowshoe or pet him as you turn him away from Sophie and place him somewhere else. You may have to reposition him numerous times, but often the behavior of staring/stalking ceases or diminishes considerably. Vary the locations you place him; first move him to a sofa, then to an arm chair, then to a windowsill – but always place him down so he is facing away or in the opposite direction from Sophie. When Snowshoe is not staring at Sophie, or when he ignores or looks away from her, make sure to heavily reward him. To prevent or interrupt staring at it’s onset, always be positive or calm, and redirect through toys, play, food or petting. Reward Sophie heavily for being confident. These are only initial suggestions. Depending on the extent or severity of the chasing or attacking, and how often fights occur, many other approaches and behavior modification suggestions should be implemented. 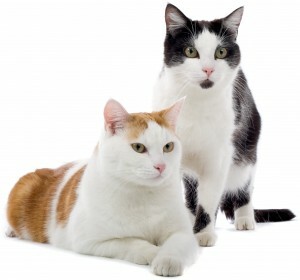 When two cats are fighting or when one cat is harassing another cat, it is best to have a formal consultation so each cats’ needs can be addressed and behavior modification can be tailored to the specific dynamics and interactions between the cats. When you are not there to supervise, it is best to keep the kitties separated. Feeding cats communally (at the same time, but from separate bowls/plates) is also helpful to encourage bonding. Always feed them at a distance where they feel comfortable. Cats should be free fed, as well as have communal meals, such as wet food. When food is rationed, cats can be restless, and this often can create spats or aggression between cats. You did not mention the actual behaviors Snowshoe exhibits when he ‘picks on’ Sophie or when they occur. If Snowshoe’s ‘picking on’ Sophie is play-based or out of boredom (i.e., hiding and pouncing; stalking, then pouncing and dashing away), having good quality play sessions with Snowshoe will be important to redirect his energy to something more appropriate. Young cats can frequently antagonize older cats.